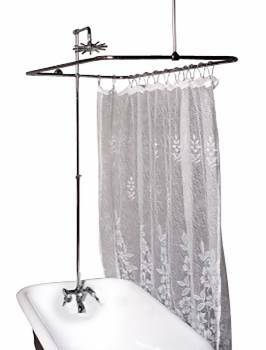 Inside Tub Wall-mount: Complete vintage tub shower package for a traditional bathroom look. Includes Rectangular Surround made of sturdy chrome-plated brass tubing 3/4 in. thick. Wall and ceiling braces can easily be cut smaller to measure. Adjustable Riser Shower and luxurious Rainfall Showerhead. Traditional faucet and lever diverter made of tarnish-resistant chrome-plated brass and Drip-free Ceramic 1/4 turn valve. NOTE: For inside tub wall installation ONLY.